It is highly likely that no Catalan person aged more than four or five has ever stepped on a terrazzo-paved floor made by Mosaics Planas, s.a. This sentence would have filled Miquel Planas Pujadas (1907-1989) with pride, when he and his brother Mateu set up the company in 1931. Indeed, many public and private buildings have been paved with one of the models made by our firm. This new catalogue includes the latest ones. During the 1970s, Antoni Costa Massó (1936-1984), the true promoter of the company’s automation and expansion, put the following title on the catalogue that was published during those years: “The skin of floors”. Time has proved him right: very few industrially-manufactured products have been so successful in demonstrating their suitability. Terrazzo blends with any type of space, and its appearance and functionality are not damaged over time. 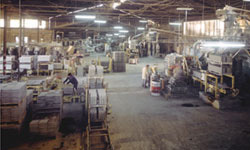 Its resistant, durable technical characteristics are unique, and have converted it into the skin of the buildings in which it is used for paving. The company now has a history spanning 80 years and is run by the third family generation, led by Roser Planas Garriga –daughter of the founder-. Without forgetting the experience passed down through the generations and through expert management, new production equipment has now been introduced and quality controls improved day by day. The company produces new products and provided more competitive services. This new catalogue describes our latest product range, and takes a look at some of the work done during recent years, many of which are a symbol of the avant-garde in our land, and a social and urban reference in the towns and cities where they are located. Terrazzo tiles for interior use, in all their uses (normal, heavy or industrial), special terrazzo paving (conductive, recycled, ground paving for plastering), a whole range of terrazzo tiles for outdoor use with every kind of finish (moulded, ground, shot peening, Vibrosil…) and special tiles and products (with grout coating, for plinths, with conductive mortar). In addition, we also present what is most important for the company: an organisation which is ready and able to fulfil the expectations that you, our customers, have placed inMosaics Planas, s.a. 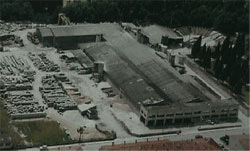 In the knowledge that we are a leading Catalan company and a name of reference in Spain in the market of terrazzo paving for indoor use, the staff of our organisation is aware and ready to face the future with all the force and illusion of knowing that the next generation of Catalans will continue to step on the terrazzo paving of Mosaics Planas, s.a., the true skin of our buildings and floors.